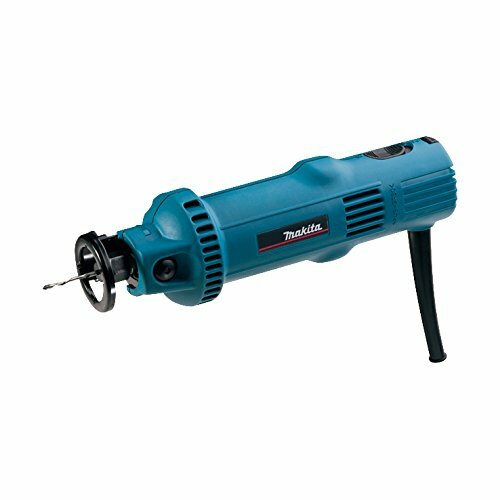 Which is The Most Recommended Rotary Tool? 1 – What is the Difference Between Rotary Tools and Oscillating Multi-Tools? 2 – What is the Difference Between Rotary Tools and Hand Drills? 3 – How Should You Hold a Rotary Tool? 4 – How Do You Change Rotary Tool Attachments? Rotary tools have replaced the need for buying numerous single-use tools. As a professional contractor, engraver, or DIYer, you only need to buy a rotary tool kit that comes with an assortment of accessories. Such a toolkit will help you handle various tasks like engraving, cutting, sanding, polishing, grinding, or trimming your pet’s nails. This guide features the best rotary tools on the market today. Depending on your profession, the intended use, and budget it has something that will perfectly suit your needs. Whereas some of these tools are very powerful while others are very affordable, all are durable and of the best quality. Cutout tools are a special category of rotary tools for making precise holes and cuts in drywall when installing features like sockets and switches. They feature adjustable depth guides that ensure you don’t go beyond the intended cutting depth. Cutout tools can either be cordless or corded. The corded varieties offer greater RPM, while the cordless options are ideal for remote job-sites where more intricate cutouts are needed. Despite being specifically designed as drywall cutting tools, they can still be used on other materials when equipped with the right cutting accessories. The DEWALT DW660 Cut-Out Rotary Tool features a powerful 5-Amp motor that provides a speed of 30,000 RPM. It is versatile, lightweight, and handy, making it a good investment for home-repair hobbyists and drywall contractors. It comes with 1/4” and 1/8” collets plus 1 drywall cutting bit. This DEWALT cut out tool lacks variable speeds. However, the fact that it is very powerful and specifically designed for drywall cutting, the single speed of 30,000 RPM is justifiable. The DEWALT DW660 might be marketed as a drywall cutting tool, but with the right accessories, it can be used for cutting other materials like tiles, plywood, and laminate. It is the best power tool to cut drywall, making it a great companion for professional drywallers and electricians. The Makita cut out tool 3706 has a powerful 5 Amp motor that delivers a speed of 32,000 RPM, which is more than enough for a rotary cut out tool. The tool is well-built and lightweight in design, making it suitable for cutting through drywall and other materials. Its sealed switch offers protection from debris and dust, hence enhancing its durability. This Makita drywall cutter is a worthy investment for drywallers, electricians, and DIYers. Its two-way slide/bump switch and the durable 10 feet cord offers for easy handling, while the powerful motor allows you to cut fairly easily through various materials. 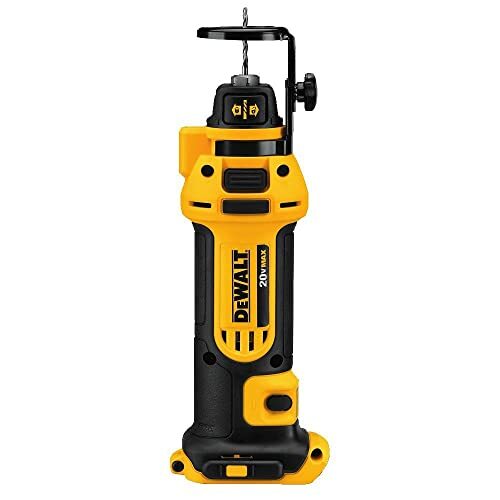 The DEWALT DCS551B 20V stands out among the drywall cutting tools since it is not only powerful but also cordless. The tool is powered by two lithium-ion batteries that help it deliver a speed of 26,000 RPM. The DEWALT cordless cut out tool comes in a lightweight design and throws a little less dust compared to other tools in the cut-out category. However, it doesn’t come with a storage case. Despite being a wonderful cut-out tool for remote use, you will need to get the case separately. If you are a professional drywaller or contractor who spends the most time in remote areas, this cordless cut out tool is a wonderful companion. With the right accessories, the DEWALT 20V cordless cut-out tool can also be used to cut through other materials. The collect accepts both ¼’’ and 1/8” bits. Below are the most powerful rotary tools that come with electric cords, variable speed control, and numerous accessories. 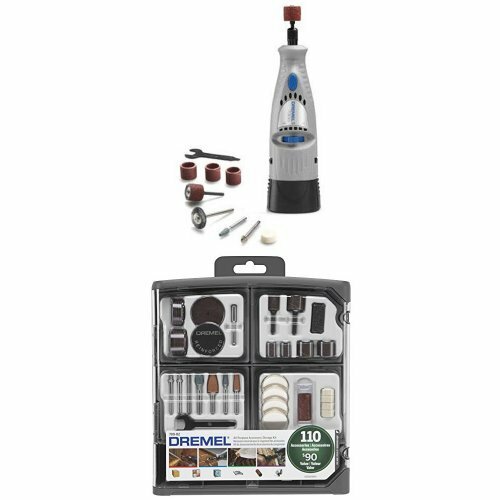 1/32", 1/16", 5/64", 3/32", 7/64", 1/8"
As expected, Dremel rotary tools top the list with awesome features like over 30,000 RPM, electronic speed control, and a wide array of accessories. These tool kits are suitable for professionals who are looking for powerful, high-performance rotary tools for multi-purpose uses from construction to crafting. The Dremel 4000-2/30 is undoubtedly the best Dremel rotary tool, which makes it stand among the most powerful rotary tools in the market today. 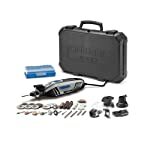 The tool comes with over 160-piece accessory set and an adjustable speed of up to 35,000 RPM. The Dremel 4000-2/30 comes with a high speed, low torque design, which makes it very speedy and easy to get the carbon brushes choked. Hence, you should avoid applying excessive pressure on it. The Dremel 4000-2/30 is the perfect corded rotary tool for precise carving, cutting, sanding, and polishing. If you are a seasoned DIYer, hobbyist engraver, or professional home builder, this is the perfect multi-tool for you. Dremel 4300-5/40 Rotary Tool has a relatively larger motor than the 4000-2/30 model. Its electronic feedback system maintains the speeds and performance when working on both hard and soft materials. It features a universal 3-jaw chuck that accepts all the Dremel attachments and accessory shank sizes. But it isn’t sturdy enough to handle heavy performance applications. However, Dremel has included a standard collet in the package just in case you want to switch to a collet. Dremel 4300-5/40 is a variable speed rotary tool with endless applicability. From engraving designs on your woodwork to cutting drywall, it stands out as the perfect powerful multi-tool for professionals and home-builders. Very quiet and vibration-free even at high speeds which makes it ideal for those who are looking to carving with a rotary tool. Some users have complained that the accessories worn-out faster. The Proxxon 38481 Professional Rotary Tool stands among the most powerful rotary tools in the market today. The tool comes with 6 high concentrically steel collets and 34 industrial quality accessories for professional and hobby use. 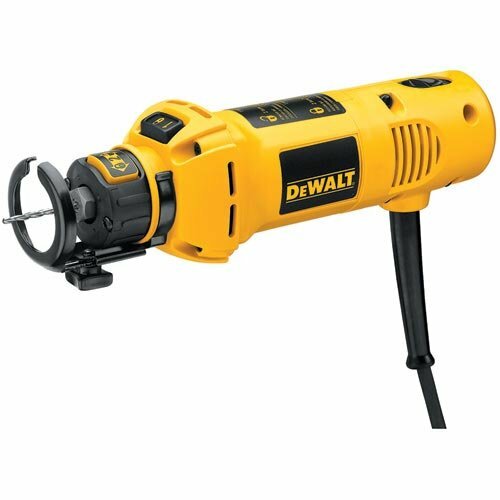 Equipped with a high performance 1/8-horsepower motor with variable speeds of up to 20,000 RPM, it is a great hand tool for professional builders and contractors. The Proxxon Rotary Tool is ideal for professionals who are looking for a multi-tool that can handle both easy and heavy-duty tasks. The tool is sturdy, effective, and powerful, not to mention that it comes with an array of accessories but not as many as you would have got with the Dremel alternative. Just because all the most powerful rotary tools are corded, it doesn’t mean that there are no great cordless rotary tools. The Milwaukee brand boasts of the most powerful cordless rotary tool while Dremel stands out with its versatile cordless tool. All the tools in this list feature a rechargeable Lithium-Ion battery that takes less than an hour to fully charge. The Dremel 8220-1/28 features a variable speed rotary tool with up-to 35,000 RPM. The tools offer high performance and versatility. It comes with separate speed control and on/off switches for better control. This Dremel Cordless Rotary Tool offers both high performance and affordability. It is suitable for workshops, home remodeling, and DIY tasks like sanding, cleaning, grinding, and cutting. However, it is not the best tool for precision tasks like engraving. The Milwaukee cordless rotary tool comes with variable speeds of up to 32,000 RPM, and a powerful motor. This tool is suitable for contractors, plumbers, and home re-modelers who do most of their work in the field where there is no mains electricity supply. If you are an engraver who likes doing your stuff under a tree or in an open workshop outside your house, then this might just be the best tool for you. The Milwaukee 2460-21 M12 comes with only 5 attachments and no accessories. But the good news is that it can perfectly fit most of the Dremel’s accessories and attachments. 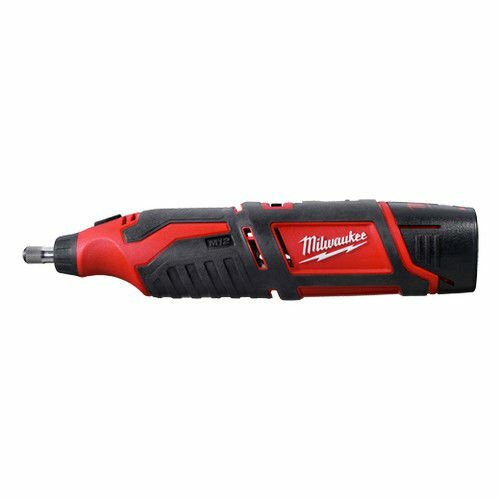 The Milwaukee 2460-21 M12 is the perfect tool for those who are looking for a powerful battery-powered rotary tool. Whether you are need of a multi-tool for construction needs or DIY tasks, it is the best fit when it comes to power and flexibility. 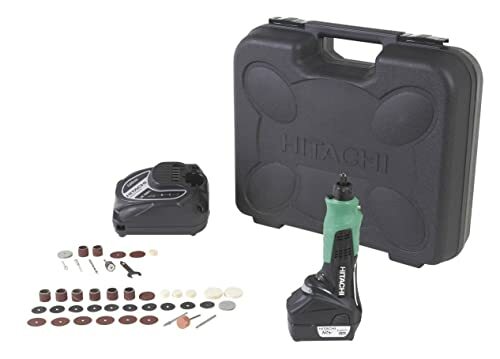 The Hitachi GP10DL Cordless Rotary Tool offers better control and precision compared to other cordless rotary tools. The tool is perfect for engravers or jewelry polishers who are looking for a lightweight multi-tool to handle fine carving, sanding, or polishing tasks in the field or workshops. However, it is not the best tool for DIYers, professional home builders, or contractors. The battery power lasts for only 1.5 hours, but with the low battery indicator, you get the warning before it runs out of power. It only takes 40 minutes to recharge the battery. Despite having up-to 35,000 RPM variable speeds, it is not as powerful as the Dremel or Milwaukee cordless rotary tools above, but it is the perfect alternative if precision and detail is a thing for you. Its lightweight, compact design, and anti-vibration technology help you engrave awesome designs on woodwork and glass. An inexpensive rotary tool kit is ideal for light projects and occasional use. Such a tool is suitable for those who are looking for quality multi-tools at budget prices. The WEN 2305 Rotary tool offers superior flexibility with variable speeds of up to 30,000 RPM. It includes a flex shaft and 100 accessories and attachments for polishing, trimming, sanding, cutting, and drilling. 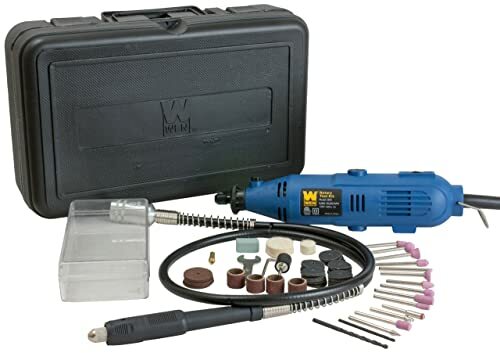 The WEN 2305 rotary tool kit might not be the ideal tool for professional use, but it is the best tool for regular DIY home needs. If your cat likes scratching on your beautiful couches, this might just be the best tool for trimming its claws. Nevertheless, if you are a DIYer who would like to get a rotary tool but can’t afford the best Dremel tool, then this is a nice alternative. The tool overheats after a few minutes of use. You should consider turning it off and let it cool for a few minutes when using it for a longer duration. 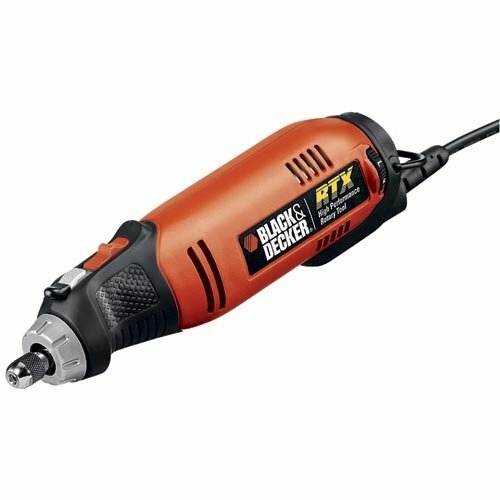 I can comfortably say that the Black & Decker RTX-B is the best rotary tool for the money. It features three speeds of 12,000, 24,000, and 30,000 RPM. With its universal collet system, it accepts all the standard rotary tool accessories like most of the Dremel attachments. However, the tool has an exhaust placement that blows a lot of dust. You should consider wearing appropriate gear like goggles when cutting on drywall or sanding wooden surfaces. This Black & Decker corded rotary tool is suitable for moderate DIY tasks like sanding wood surfaces, cutting a few ceramic tiles, drilling on a drywall, and grooming your dog. Although, it is not the best tool for precision tasks like engraving. 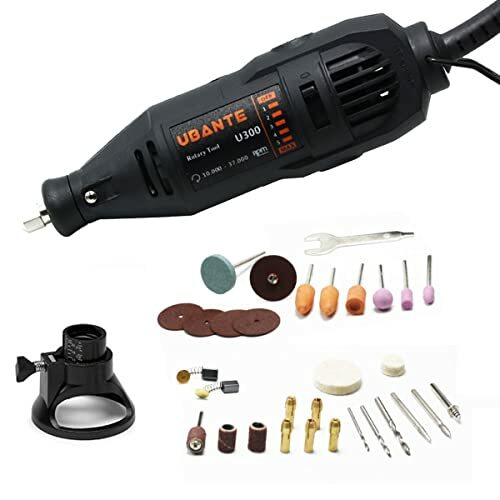 The UBANTE U300 Rotary Tool features a powerful 1 AMP motor with variable speeds of up to 37,000 RPM. Despite being in the budget rotary tools list, it comes with an electronic feedback system for speed control depending on the work type. The tool is perfect for grinding, deburring, drilling, shaping, polishing, cutting, and sanding. The UBANTE U300 variable speed rotary tool perfectly suits a home builder or DIYer who is looking for a powerful tool but on a budget. With this tool, you can clean and restore the shape of your old furniture, do a bit of engraving, and cut drywall with much ease. The Dremel Cordless Two-Speed Rotary Tool (model 7300-N/8) comes with two speeds of 6,500 and 13,000 RPM. It is ideal for simple tasks that demand less power like smooth sanding small surfaces, grooming your pets, and cutting plastics. The Dremel 7300-N/8 Cordless Rotary Tool will only meet your expectations if you are looking for an affordable rotary tool for occasional use from the Dremel brand. The tool is durable but not as versatile as other tools in the cheap rotary tools list. Being cordless and lightweight means that you can carry it anywhere and anytime. Finding the perfect rotary tool can be a daunting task. More so with the hundreds of rotary tool reviews on the internet that promise you Dremel is the only brand with the best rotary tools. The brand is notable for the quality and durability of its tools, but it isn’t the only place to find the tool that perfectly suits your needs. 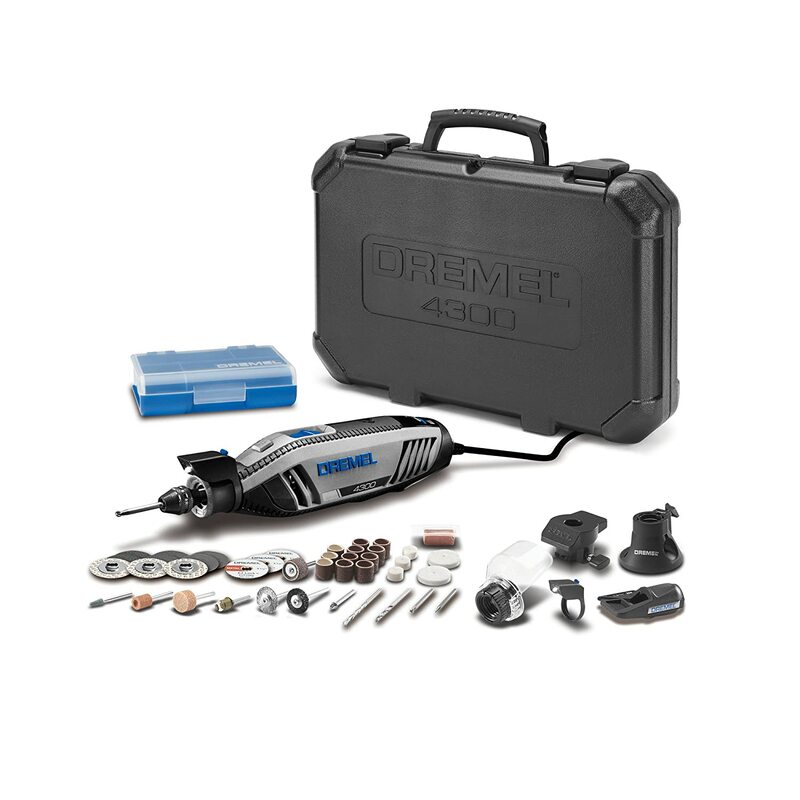 If you are looking for a powerful rotary tool for professional use, the Dremel 4300-5/40 is the best rotary tool kit for you. The tool stands out from the rest, thanks to its high performance, variable speeds, and electronic feedback system. 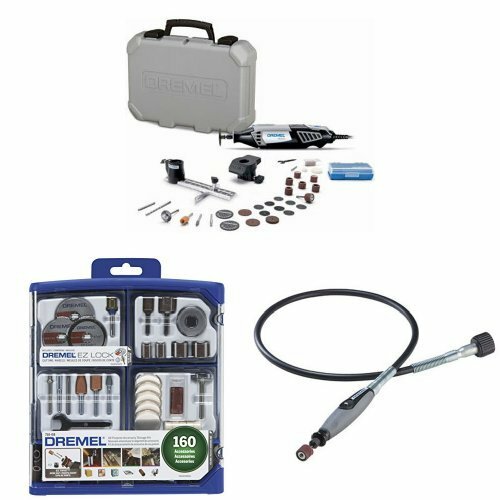 The fact that it comes with a universal 3-jaw chuck which accepts most of the accessories in the market positively distinguishes it from the Dremel 4000 series. In case you are mostly engaged in the field or workshop, the Dremel 8220-1/28 should be your trusted cordless rotary tool. The tool comes with 12-Volt Max power, variable speed control, and fast accessory changes. Such features make it extremely powerful, not to mention that you will only need an hour to put the battery into a full charge. For professional home builders and avid DIYers who are looking for a reliable cut out tool, the DEWALT DW660 is a good investment. You might not manage to afford these tools, but that doesn’t mean there is no something for you in the rotary tools market. 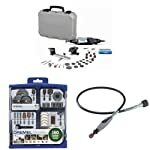 The WEN 2305 Rotary Tool Kit with Flex Shaft is a great fit for DIYers who are looking for a device with a wide assortment of accessories but at an affordable price. It comes in a lightweight design for easy control. I love finding new ways to use the tools that I already have in my garage toolbox. The rotary tool is one of them, and very often I find myself trying it out when remodeling or repairing something in my house. Owing to the tons of attachments that come with this tool, it gives users the ability to employ it on a wide array of applications. With the help of a straight bit or wheel attachment, you can use a rotary tool when cutting. The cut-off wheel attachments are somewhat tiny. While I have used it on several occasions when trimming sharp plastic edges and cutting thin metal work, I feel that the real cutting happens when I use the multipurpose straight bits. Straight bits can be used when cutting holes in drywall or cutting wooden materials. For example, you may want to do some patching on your wall. You will often start by cutting the area before performing remodeling work on drywall. A rotary tool with the straight bits can provide a powerful alternative in such a scenario. Despite being very powerful, you will find it difficult to cut woods that are over half-inch thick with this tool. What I loved most about its ability to cut was the fact that it can cut nails and then metallic materials. I had not tried out this before, but I hammered three 1/4-inch-thick steel nails on a wooden post and then used the cut-off disk attachment on the tool to take down all the nails in less than two minutes. You can grab the multipurpose cutting kit that allows for sturdy, controlled cuts into various materials like drywall, fiberglass, laminate, vinyl siding, and plastic. Diamond cutting blades and discs will help you cut into steel, nails, aluminum, and ceramic tiles. You can accomplish numerous small carving projects with a rotary tool. I have tried out decorative designs on glasses, frames, and tables with the tool combined with the right bit attachments. With the wood carving bits and a little practice, you can carve small designs on anything constructed of wood. It doesn’t matter the wood-type since the bit works even better on hardwoods like mahogany. Metal bits will help you engrave names or simple artistic designs on metallic tools and metals. Since I don’t do much of metal works, I love trying out the metal bits on my tools like hammers and pliers. I have my name engraved on these tools in such a way no one will “borrow” then permanently. If you are fond of this type of project, the flex-shaft attachment might just make things easier for you. A diamond engraving bit and silicon carbide grinding bit will come handy when etching designs on glasses. Simple use the diamond engraving bit to trace a design that is taped from inside the glass and then use the silicon carbide grinding bit to fill it in. I believe you can easily trace and fill designs on any transparent glass materials with such tricks. You might start by trying this on old glass appliances before putting them on your souvenirs and quality glasses. If your job or hobby entails polishing metallic surfaces, then you need to invest in a rotary tool! In such an instance, you will use polishing or buffing bits on the tool to add a shiny look to your metal surfaces. Applying a small amount of polish or wax to the bit before turning it on will enhance some good results. Use medium speed for the best results. You may find yourself using the polishing bits in your household in a number of ways. Like polishing crannies and nooks on silver jewelry. In such case, you will need a variety of polishing assortments, more so when jewelry is your main hustle. Some attachments include rubber silicon polishers that come in a variety of shapes like a knife edge, wheel, bullet, and cylinder. Apart from polishing, you can use the wire wheel attachment on the tool, at high speed, to remove rust from metals. At times, I have found myself leaving metallic tools, like hammers, on wet surfaces, something that makes them attract rust. Previously, I used to clean them with steel-wool before oiling, until I discovered the tiny wire brushes. I must admit that there is something appealing about them when doing the job. The results are perfect despite being easily achieved! A good example of how efficient a rotary tool can be is my neighbor. Since he is an oldie who is trying out some home gardening, he retrieved his gardening equipment from the store only to find the metallic parts were blunted and rusted. He managed to wash the tools with water, dried them, and then used the wire wheel to remove the rust. Later, he sharpened them with the sharpening wheel before oiling. Very effective! A rotary tool would be extremely useful when sanding intricate details in molding, furniture, or metallic pieces. It’s not the best tool when sanding large, flat surfaces. When sanding, you will need to attach a sanding drum and set the speed to medium for the best results. That is the advantage of having this tool, apart from the fact that you can change accessories to suit your need, you can also change the speed while working with the tool. Apart from the sanding drum, you can use the triangular (bullet) bits in tough to reach corners on flat surfaces. In such instances, you will want to treat with care, since I discovered that they take off a lot of material compared to the sanding drum. To be on the safer side, you can try this on scrap wood first or do it with a light touch. Sanding wheels can be used in households to trim dog nails. 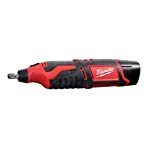 Well, I am not the pet type person, but I bumped into legit video reviews of individuals who use the tool when trimming dog nails. To me, this sounded a little bit crazy, but it actually works perfectly. So, if your dog likes scratching on that elegant couch in the restroom, you can use the tool on its nails. Pet owners advise that you use low to medium power during such an activity. At home, I often find myself attaching a grinding attachment on the tool before using it to sharpen knives. It can be a nice tool for the oldies who prefer manual gardening and lawn trimmer tools over the powered ones. Such tools often need sharpening and a rotary tool with sharpening wheel attachment will help get the job done. I have also used the tool to grind down sharp spots on metal roofing that I used on shades. Grout removal is among the handy uses for a rotary tool. In most cases during home remodeling and repair, you will find yourself patching or tearing out tiles. A rotary tool with a grout removal disc or bit will help you get the job done easily and efficiently. I will recommend you start by practicing on scrap tiles before putting the tool into the real job. A small slip on your hands and you might end up damaging the tiling. Most woodworking purists prefer the coping saw when coping moldings. It is the best tool for the job, but if you find yourself in need of doing it occasionally, a rotary tool might just be the best alternative. I managed to use the tool to crown molding and cope baseboard comfortably. During the process, I used a multipurpose cutting bit to shave wood off at the right angle. You might still have a coping saw in your basement store, but there is no harm in trying out this alternative. A rotary tool works by spinning/rotating an attachment at a high rate of speed, while oscillating tools work by moving an attachment in a rapid, back-and-forth motion. Whereas oscillating tools might tackle larger tasks quickly, rotary tools are ideal for the tasks that need more precision and accuracy like engraving. Needless to say, both the tools handle applications like sanding, cutting, and grinding, but rotary tools handle extra applications like polishing, carving, cleaning, and routing. They might look almost the same, more so to the cordless rotary tool models. Although, rotary tools rotate to speeds as high as 35,000 RPM while drills rotate to about 2,000 RPM. The drills are specifically designed for driving screws and drilling with twist bits. They are also much heavier and larger than rotary tools due to their reversible motors. There are three main ways to hold your rotary tool while working; like a knife in the middle of its shaft, like a pen at the base of its shaft, or with two hands across the length of its shaft. It is worth saying that different models of rotary tools have different ways of changing the bits and attachments. Then tighten the collet nut. Genuine rotary tools will always come with a manual on how to change the attachments. Even the most experienced and professional hand-held power tool users will still learn some new ways of using and handling a rotary tool every other time. Hence, you need to do a lot of practice with your new tool if you are an amateur or a self-confessed DIYer. That way, you will learn how it works best for you. The following safety tips and tricks will better your experience when using the tool. Always keep your children away when operating the tools. When working outdoors, you can use extension cords to avoid abusing the power cords. Always wear the right gears when using the tool. For example, you will need eye-protection gear when cutting metallic materials, since they produce sparks. Avoid using the tool for big cuts or long hours. You would rather use a larger saw in case of big cuts. From my experience with the rotary tools, I have found that the tile cutting bit does wonder when used in carving wood. Maybe, since it is very thin, quite long, and with a round tip. I have used it to make smoother edges and deep cuts on wood.